iDancehallReggae.com::Caribbean Lifestyle Media::: NEW YORK PREMIERE:"RiseUp"
Although RiseUp is essentially a Jamaican documentary film that spotlights Reggae, it transcends genre and niche, seemlessly weaving three distinct stories into one inspiring feature film that is both dramatic and vibrantly explosive. Some are saying that RiseUp is like a Jamaican 'Hoop Dreams' and the best movie to come out of the Carribbean in many years- a potential Best Documentary nominee for the 2011 Academy Awards. The film features appearances and performances by both arising and legendary artists. Directed by Luciano Blotta, a native of Argentina, and produced by Darrin Holender ('Sorority Row'), the film is the winner of the 2009 AFI/DISCOVERY SILVERDOCS Best Music Documentary Award, and was an audience favorite as an officially selected film at fifteen international film festivals, including IDFA and most recently the Bahamas International Film Festival. Recently, RiseUp was chosen by the Lincoln Center's Film Society to celebrate Black History Month this coming February on its way to a theatrical release in Jamaica and the U.S. in March. A one-hour version of the film will be broadcasted by BBC Storyville and many other television networks worldwide have ordered the film for their upcoming programming schedules. Not since the Harder They Come and Rockers has a reggae film been able to reach worldwide audiences like RiseUp. In a recent interview with Australian press, Blotta stated, "I saw how much talent there is [in Jamaica],how flamboyant, different and creative all these people were, and it really inspired me." He is excited to finally share his six-year project with audiences in New York, that can, in his words, "appreciate this priceless portrayal of a uniquely proud country". Having screened to full houses in nine countries since November, 2008, RiseUp has indeed connected to men and women, young and old, from all backgrounds. Audiences have been dancing, laughing and crying in their seats. Core reggae audiences and music doc fans have lauded the film for its authenticity and entertainment value, while general audiences have praised the film for its original storytelling, inspirational tone and beautiful images and sounds. Entertainment industry veterans who have viewed the film have commended Blotta's efforts as an invaluable contribution to both the Jamaican culture as well as the medium of documentary cinema. Excited about the upcoming Lincoln Center screening, Holender stated, "New York will definitely connect with RiseUp the way other cities have- we just need to put it on the screen in the city and a RiseUp movement will organically develop from there." 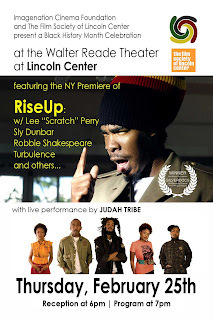 The New York Premiere of “Rise Up” will be held at the Walter Reade Theatre at the Lincoln Center on Thursday, February 25th 2010. The event will include a reception, live performances and the screening of the film and will start at 6 pm followed by a session of Q & A with the director and producer. On Friday, February 26th, RiseUp will premiere in Hartford, Connecticut at the legendary Wadsworth Theatre.